Wouldn’t it be nice if it were only 7? This month I was so excited for the ABS challenge, featuring Pablo Picasso’s “Two Acrobats with a dog”. After reading through the post, seeing all the blue, the tie in to the 7000 bracelets campaign – I was hooked. Work with shades of blue, possible science references it’s so up my alley it’s out the other side! So naturally I was stumped. I made my typical false starts and while I liked the result it wasn’t really telling the story. I backed way off the Picasso reference and worked basically with just the harlequin shape. I had decided from the start that I would be making a bracelet for the cause, even though I can assure you I haven’t made a bracelet in probably ten years or more. Probably the main reason for that is I wear two bangles. I put them on at about age 15 and they basically are a part of me. Not inclined to wear bracelets on my writing hand, I just never fuss with them. This is not the part where I tell you I am reformed and have a new found love of making bracelets. About the focal. I warned you, I did a degree in Science so I had a lot of different imagery to draw from with this idea of rare genes. I decided that I would use the harlequin shape like a window into the DNA. That white thread of polymer inside is a loose coil, an open, unwinding DNA helix. Without losing you all completely with the process of how and when a mutation occurs in a gene, let me just summarize by saying the topaz glass glitter fragments thrown about are there to represent mutations. The resin holds it all together, much like the families of those affected. 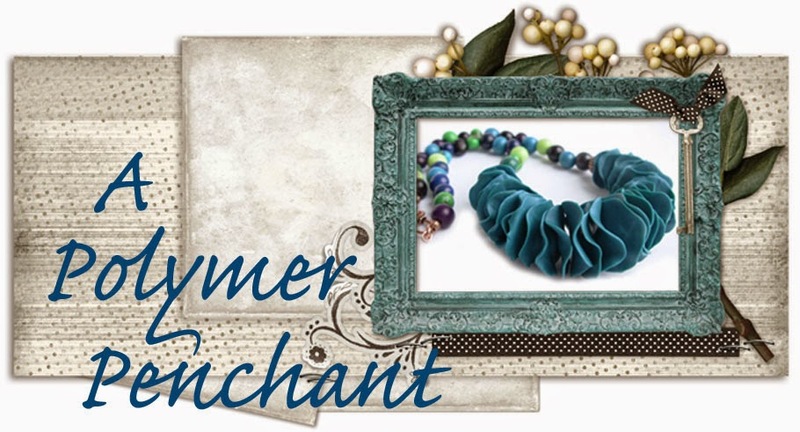 This bracelet combines this polymer focal with a couple of accent beads, large rough shaped seed beads, antique agate and cotton cord. I ended up with a simple button as the clasp, I didn’t like any of the other clasps I had on hand with it. But this lightweight button meant I needed some heft added to keep my equally lightweight focal on top of the wrist. So I ended up with two rondelle agate dangles at the clasp and I’m pleased with the mechanics. This was my first time adding resin to polymer and I was so happy to find a piece to try that out with. Since I expected that the batch of resin would go a lot further than just one polymer bezel I created 7 along this theme. I have zero experience in photographing shiny surfaces and had the help of a two year old at the time, so the above is the best I got, you get the idea I hope. I’ve left them undrilled for the moment so I can have maximum design possibilities. I’ve decided I will complete all 7 bracelets with a variety of designs before 2013 is here. That may sound a ways off, but I want to take my time and give the best I can rather than rush to the finish line. I will share each one here as it’s created and then send all 7 at the end of the year. I’m not sure if there will be a confidentiality issue, but I would love to find out the specifics of a certain condition or two of those who have been on the list to receive a bracelet the longest. I’d love to give something that speaks directly to the condition. I think that would give the wearer a strong basis for discussing it and raising awareness. There will be 7 bracelets from me, now if only there were just 7 rare diseases. Thank you Art Bead Scene team for being such an inspiration in so many ways. I’m deeply saddened to hear of the lose of two little babies, born too soon and one more little boy still fighting hard. These triplets were born to the owners of Sinarin Silver whom I don’t know personally but the story touches me so, as I myself am mother to a preemie. At her smallest Averleigh was a mere 640g (about 1lbs6oz), I remember sharing that number and often hearing back some version of “think of a pound of butter”. I can tell you that that is a little hard to hear. People are just trying to get a grip on what a baby that size really looks like, I get that, I know there is good intention there. But. What I know as the fragile strength and determination of a child born early is just not compatible with inanimate objects, like butter. I promise you I’m not bitter, but want to express that sensitivity to words. I am a bit paralyzed in finding words to comfort and encourage this couple. But I’m fumbling through this post to spread the word following the lead of Fusionmuse Tanya. She shared the story on her blog and is offering a giveaway with multiple opportunities for you to participate. I hope you will visit her post and spread the word to offer whatever support you can. I’d like to add some resources which I found invaluable. I found them when Averleigh was probably about a year old and wished I would have had them before then. Life with Jack is a blog born out of a series of emails that Jon the dad wrote to keep family in the loop. (Actually I think Jessi had the blog, but there was a significant shift in focus). This story is incredible. Both parents are engaging writers and Jessi, the mum, is an incredible photographer. I’ve followed along for the last year plus and Jack is just an absolute inspiration and lesson in joy. The Inspire preemie support community is also a wonderful place for those touched by prematurity to connect. In particular I wanted to add this for the parents because of the Preemie Angel board. I will be thinking of this family. Thank you for reading. The last week was a blur. Hectic at the day job, lots of time outside and a day at the zoo meant not much time at the work table creating. I had mentioned a new feature I had planned to share – I’m going to put that on hold for a bit since there is lots coming up! I will now organize my thoughts via blog post, m’ok? My bead soup came for starters (oh man, and the puns never end- really wasn’t even intended). It’s so very awesome with just the right touch of challenge. I can’t wait to see all the amazing creations with this weekend reveal but I’m really happy right now our reveal is August 11th (…I should really swap out that button on the side bar). I’ve done a lot of contemplating, but no real start yet. Although I think a promising idea is taking root, I’m just a little unsure of the mechanics. Totally stealing more from Lois’ blog (again) – she did such a nice job telling the story of the soup she sent, it sure is well travelled! Look how perfectly those colours match the focal , and the clasp pattern speaks so nicely to the focal too. Before I can really tuck into that lot, I have to wrap up my ideas for the ABS July challenge and 7000 bracelets tie in. I started one way and decided to put it aside and start fresh. That led me to finally cracking open the resin I bought years ago that was waiting quietly, like so many good supplies. Here is some of the experiment. Only two bubbles in the whole lot, I can live with that. I’m saving the ones I have planned for making into bracelets for the project for another day. It won’t be long as that deadline is approaching. I know I can get one bracelet made in time, but I did make seven focals in hopes of getting seven bracelets made. I think I may plan on having seven done before the end of the year and then send them off. Does that sound like cheating? I struggle with bracelets so I want to leave myself lots of design time. Two more challenges coming up too! First will be the Thrift Store Blog Hop (darn gotta get that button up too) I showed you my starting spot already, and not much has changed - yet. It’s just moved around the work table mostly. That reveal is coming up on August 4th. Then there is the Blogging Link Challenge – I got my package today, right on time, and I’m fighting the urge to play with them as that reveal is not until August 17th. So lots of exciting creating on the go, sounds like a great reason to skip out on the laundry… again. Are you beating the heat? I’ll spare you the whole string I fired off. It’s nothing fancy, or technically strong. It made me stop dead in my tracks though. That's my girl with a long shadow and it’s the first time I’ve ever caught her in that context. It brought me right back to the day she was born and how thankful I was that my husband and I had opted for iPhones, for both of us, the Christmas before. As she came by surprise, and I saw her only for a split second. If my husband hadn’t of had a cell phone with a camera on him that day (he arrived at the hospital in softball gear, from the field) he wouldn’t have been able to take and text me that photo. I wouldn’t have had it to literally cling to for the 12+ hours it was before I got to see her, – when I was supposed to be “sleeping”…. 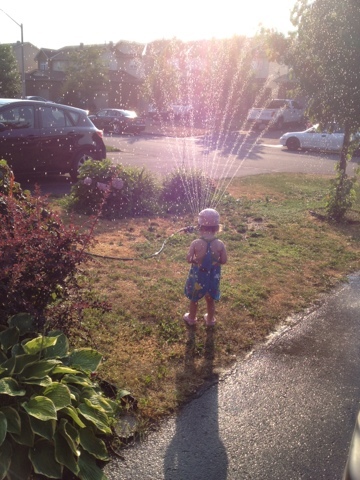 Today I’m thankful for cell phone cameras, sunshine and little girl shrieks of joy. That beats any heat. Time to show off some ingredients! Well, what happy news I got from Lois this morning that her bead soup has arrived! What a relief, as I had that little seed of doubt when the post office tried to confuse the heck out of me. So without any further ado let me tell you all about my partner and the soup I sent her. I didn’t tell you all about Lois Moon de Padilla before, since one of the things I was immediately drawn to on her blog directly inspired the soup I sent. I saw this peacock cuff and just couldn’t resist. Seriously gorgeous. I’m not sure what kind of Voodoo Lori Anderson gets up to with her pairings, but whatever it is that magic is well honed, with this the sixth Bead Soup Blog Party. When we connected by email basically Lois and I discussed that we were open to possibilities. Actually, I did say that I don’t care for yellow but if it was part of her plan I would take on that challenge. Lois quickly and rightly summed up that we both have interest in poppies and peacocks. Since I had been working with poppies that felt too easy. Her mentioning peacocks just cemented the initial idea in my mind. So I plucked a peacock feather from off my wall (it was tucked behind a little framed elephant) and used it as my jumping off point. I figured it would be hard to go wrong with something as lovely as a feather, right? I did worry a bit about how robust it would be, but really how gentle are birds with their feathers? So I jumped in and made the focal and some coordinating pieces with the feather – hope for the best, right? why not give it a try, right? Can you tell how nervous I was to start! This last one she made, amazing! Since I was being so daring I really pushed the envelope with the clasp. This started as a purchased bezel clasp which I embedded some feathers, from lower down the plume, into the clay. I kept the rest pretty simple clay wise, just a dash of turquoise and a little texture. Now I’ve followed the BSBP for some time and I’ve seen how much some people add, and while it’s really awesome I wanted to leave some room for Lois to add her own treasures so it wasn’t just “all me”, ya know? I opted for a bit of restraint with the rest of the coordinating bits and bobs. 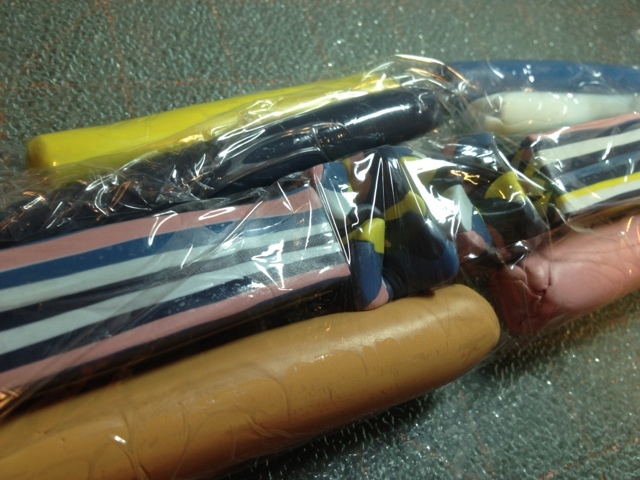 Here’s all the polymer I made except for some little ones I found in my stash in the next picture. I can’t wait to see what Lois does with this starting point. I can’t wait to see what she sent (note the watched mailbox is an empty one!) and of course I can’t wait to see all the beautiful soups grow up into full meals of wonderful jewelry. Well I tried today to go back to my clay and make some special beads to become bracelets for the ABS challenge. A few minutes in and I decided to just put it all away. Wrap it up. Put it away. Go do something else. Do you ever do that? I was at the point where if I didn’t just get it out of sight I’d keep fiddling and ultimately make all those colours into one mud pile. So instead, to keep something moving creativity wise I got to work on a logo. The real push for this was a sale at Moo that I wanted to be sure to catch, ending today. I’m mostly happy with it. I’m no graphic designer, just doing what I can to get something cohesive going. Once I had that I created some stickers and minicards which I think are going to be awesome. That then lead me to trying my hand at a blog header…which lead to a changing up the colour scheme…which somehow lead to some wackiness in the sidebar (even thought I didn’t touch it). After what must of been an hour fiddling, much frowning and muted swearing – I give up. For the most part though, I like the new look, it’s pretty bright for me, but hey it’s summer! Hope you are enjoying the weekend. Monday I’ve got a new feature planned. One I think will be a regular occurrence, hope you come back to check it out! Small hint – it’s handmade focused. I was so excited to get to work on this month’s blues of the ABS challenge. But I’m totally intimidated by bracelets I’m realizing. So I’ve stepped away from the worktable most of the week to give the work some breathing room. I think I like it, but then I am not convinced. Waiting for the bead soup to arrive is hard to do patiently. I had packages come Monday, Tuesday and Wednesday but none was the much anticipated bead soup. Busy weekend ahead so hopefully that means it will come tomorrow since I won’t have time to play. I did a little shopping this afternoon, just a few things we needed but mostly to get out of the house and just look around the shops a bit. Our Winners/Homesense is under one roof and the gourmet type food aisle seems to grow every time I go. I stopped myself from buying a $15 tin of tea since I just liked the tin and it wasn’t a type of tea I like. I have purposefully not taken a picture since then I’d want it more! Basically shades of blue elephant with London skyline across the bottom. 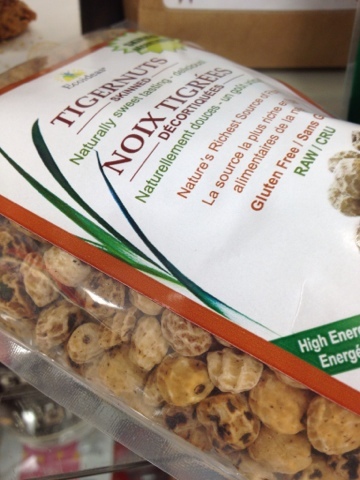 I thought these tigernuts looked like they’d make great beads, but decided to leave them on the shelf too. While my partner and I are waiting for our bead soups to arrive I thought I would take a moment to tell you how I got here. I’ve never been very good at writing up those little bios, or artist statements and the like. The mere thought of doing so makes me get a bit twitchy. Time to start connecting the dots a bit though. I come from a creative family. My Dad with the language and carpentry skills, my brothers all play guitar amongst other things and my mum went to art school and can create with anything. Cooking, gardening, pottery, copper enamelling, a myriad of different embroidery and the list goes on, she can do it all. This was the soil I was planted in. I was always creating in some fashion or another. My most recent venture into the polymer world started in 2007 and my most recent foray into jewelry followed as a natural progression. A couple weeks ago when the buzz around bead soup participants was the why and when around when you started making jewelry. That got me trying to think of an actual starting point, and boy did I struggle narrowing it down. It’s not quite carbon dating but from a collection of vague bits of information I think I can place my first polymer pieces as being made around about age 8-10 or so. First bit of evidence: my collection is stored in a recycled gel container from the era in the 80s when my brother wore his hair spiked high and the empties were plentiful. Fuzzy sticker embellishment on top of course. A variety of creations. The owl and cat I know were direct copies from some fimo book I remember getting (so I was old enough to read). The tigger was later on and remember it was another book that came with a selection of sculpey across the bottom. Gluing seed beads onto suede lace, yeah that one’s not memorable. I thought I had a photo but turns out not. The last dating clue I had in this little remnant of the past was a mostly seed bead bracelet studded with a few silver rose beads. I distinctly remember creating it after visiting the very first Sassy bead shortly after it opened in the “early nineties”. My brother had taken me and we’d spent quite awhile picking out beads and as we went to the cash I had that sinking feeling that the money in my pocket was not going to cover what was on this little silver tray. My brother, I’m sure (now), fully aware of my struggle refused to let me put anything back. I remember the bill was 31 something dollars, I couldn’t say how much of that I contributed, but I know my brother the university student didn’t really have the funds for bead shopping, but I left that store one happy girl. I guess the rest is history! First things first, my Bead Soup is officially on it’s way! Now, it was supposed to be sent by July 2nd, and I had every intention of getting it off on Friday before the holiday Monday but that just didn’t happen. I confess! Now, after a good chunk of time online trying to figure out the best method to ship it, and another 5 minutes at the counter discussing options I’m not entirely sure what way it shipped. How crazy is that? Things got even more confusing as it just barely passed the infamous “slot of doom” test. To ship by lets call it “regular mail” you must be skinnier than 20mm if you’re not then the options get all crazy. Essentially, I believe I payed half the price to ship it “light packet” by air than have it go ground as “small packet”…. See why the confusion! All that to say, I’m going to tell you all about my partner once the package gets there (I really don’t want to give anything away)– and I’m very curious to know when that will be! Meanwhile here is a sneak peek. Oh dear, looks like some sort of kitty snuggle photo bomb. You will just have to wait! But look at that china! Isn’t it gorgeous? I love it and I should really eat off it more often. But I’m not just showing it to you to be mean about the beads heading South, or to confess that I almost never entertain. I’m showing you my fancy pants china to show you how much of a blue girl I am, that's my true colour. I love blue, always have. There are three bedrooms in my home and they are all blue, same goes for the kitchen. Yup, I often choose blue over everything else. So when it came time to start filling the shelves of my shop I reminded myself to use the whole rainbow. That backfired. I’m not alone in my love of blue and this month’s challenge over at Art Bead Scene is just blue all over. 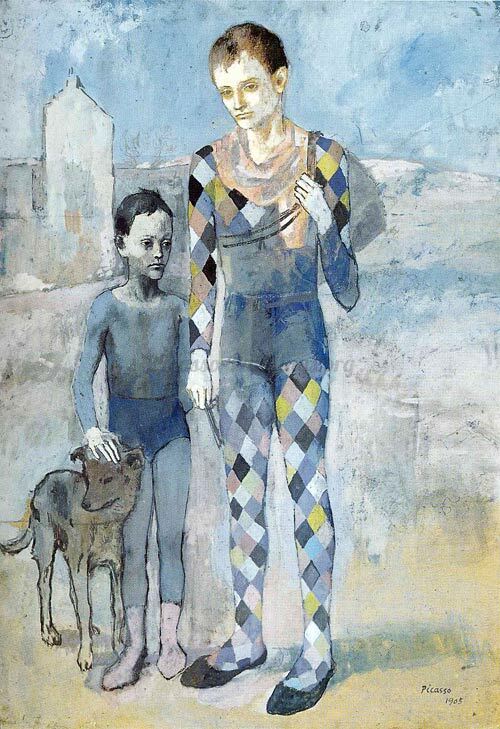 That’s Pablo Picasso’s “Two Acrobats with a dog” circa 1905. As you soak in all the blue, be inspired to join in the 7000 bracelets project. My brain is spinning up designs and with a background in Science I’m probably going to be walking the line of geeky craft, but we shall see. Don’t ring the Nerd Alert bell just yet. Wow! 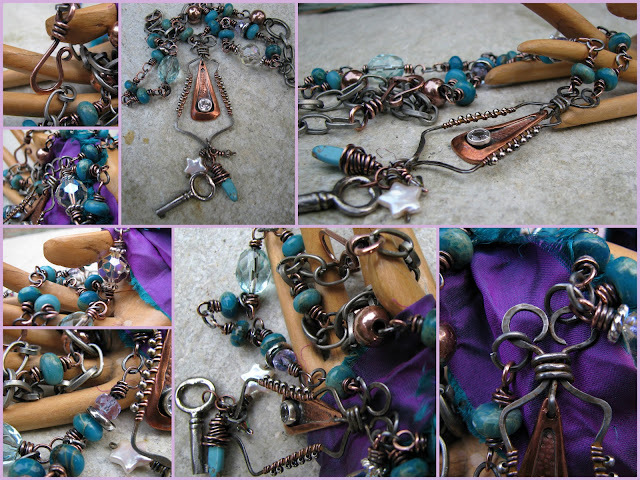 Scrolling through my google reader today and what do I see, but my necklace on the Art Bead Scene blog again. I was distracted, so a bit confused as to what I was seeing and it was at that moment I remembered there are prizes – and hey I had won! Awesome. So having won a pile of wicked beads a couple of weeks ago and now a gift certificate for B’Sue boutiques it may be time to go buy a lottery ticket as the good (and bad) usually come in threes right? I’ve been working hard at filling up my shop, I’m such a slow poke, but getting faster. So after seeing my poppies online again, I thought I really should get my but in gear and get those listed. All the feedback I’ve had so far has been very motivating. Growing up in Ottawa, the capital of Canada, means I’ve been spoiled by big time fireworks and celebrations. But this year we were pretty low key. We basically played outside all day. Which for a Canadian woman who hates the cold that is a a pretty good way to celebrate. We have family in the US and for many summers we would celebrate the 1st here and go on down for the 4th. All’s fair though as they would often do the double dip come Thanksgiving. 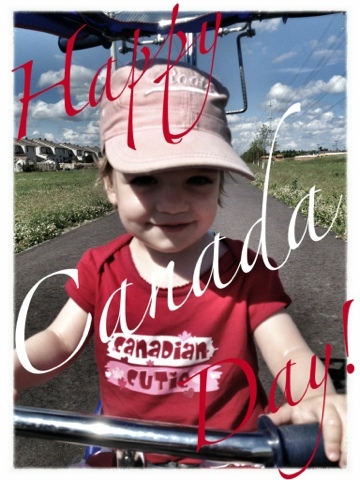 So Happy Canada Day! Happy 4th of July! (almost) as I suspect many are celebrating this weekend. Or just plain old Happy Saturday!